Graduate student Dan Sarbacker strikes a balance between his demanding coursework and his passion for the loud crowds and adrenalin-filled atmosphere that are part of the bone-cracking game he loves. The second-year master’s of business administration student approaches both his education and his sport – Australian Rules football – with a similar intensity. Sarbacker — who carries an 18-credit class load, serves as vice president for the Graduate Business Association and does some consulting projects on the side — jumps on every opportunity to play and be a spectator of Australian Rules football, or “footy,” as it is commonly called. He has organized, played and coached for club teams and advanced to captaining the American national team, USA Revolution. He competed last month with the Milwaukee Bombers in the 14th annual USAFL National Championships in Louisville, Ky.
Australian Rules football is highly popular in Australia. Sarbacker says the sport’s rules can be easy to learn but the game’s not necessarily easy to play. Not to be confused with rugby or even American football, which are very territorial, Australian Rules football is more like soccer in that it is free-flowing. A full-contact, no-pads sport in which players have many means to move the ball, handling and kicking, and in which opponents are allowed many means to block – more aptly, tackle — every play, is considerably gutsy. Sarbacker spent the summer in search of internship work that brought him to Mansfield, Victoria, for 10 weeks to play for the Mansfield Eagles, part of a highly competitive club league, during the bulk of its season, which occupies the Australian winter, which runs from April through September. In an article on Sarbacker that appeared in the Australian newspaper “The Age,” Mansfield coach Craig Kelly says Sarbacker was recruited for his skills on the field. Though Sarbacker modestly says he failed to make “obnoxious errors,” his performance earned him his spot, and his tackling in particular was a significant asset to the team. 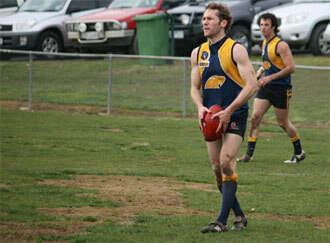 Sarbacker took an interest in footy after college, having heard about it from track and soccer teammates and friends. An Australian teammate in St. Louis persuaded him to follow the Geelong Cats, a professional Australian team. “He promised a lifetime of misery and losing grand finals. But they’ve been all right since I started barracking for them,” Sarbacker says. Playing footy has involved plenty of national and international travel, but his decision to pursue an MBA is what brought him back to Madison. A native of Verona, Wis., Sarbacker says he grew up admiring UW–Madison from an academic perspective and also from a seat alongside friends and family in Camp Randall, the Field House and the Coliseum. After earning a bachelor’s degree in architecture at Washington University in St. Louis, and living, studying and later working 12 years St. Louis, he decided to complement his design-focused education and career with a specialization in business. “It’s something I had in the back of my mind for a long time. And UW–Madison is a phenomenal institution,” Sarbacker says. Being in Madison also gave Sarbacker a chance to reconnect with family. Sarbacker’s supportive family has seen him play footy and have become fans. Coincidentally, his sister Jenny Sarbacker is the former captain of the American national women’s team, USA Freedom. Sarbacker said that after his grandfather, Howard Bremer – who has done patent work for the Wisconsin Alumni Research Foundation since 1960 – saw him play, Bremer lamented the fact that the rigors of the sport are too challenging for octogenarians. “I jokingly told him he’s the fittest 80-something I know and he should give it a go,” Sarbacker says, knowing his grandfather would have enjoyed the sport. Sarbacker admits that he has suffered his fair share of injuries playing footy, and a 10-year career for professionals is a long one. “There could never be a Brett Favre in footy,” Sarbacker says. Sarbacker is preparing the American team to pursue the International Cup next August, an Australian-hosted event that takes place once every three years in Melbourne. Sarbacker has big plans and career ambitions after graduating from the Wisconsin School of Business. With his MBA, he plans to expand his consulting work and have a greater hand in the development of innovative products. For footy news, Sarbacker follows USFootyNews.com.